Welcome to the Freeola Internet customer support pages. This guide is designed to help with setting up a Freeola email address on a Nokia N8 device. For more internet help topics please visit our main Support Page. From the home page or home screen open the Main Menu and choose Applications. 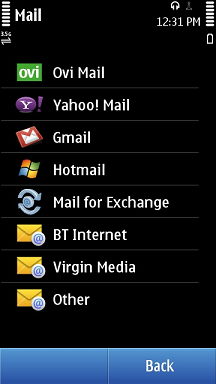 Select the Mail application. If you are asked No mailbox defined. Define now? select Yes. If you are not asked this, choose Options and then New Mailbox (or just New). Choose Start and then Other. To integrate your Freeola email address, enter your full email address in the E-mail Address field and the password for that email account within the Password field. Click the OK option and then choose POP/IMAP. Select the Username field and enter your full email address and press OK. Select the Password field and enter your email account password and press OK. Under Mailbox Type choose POP or IMAP, the correct server type is displayed in your MyFreeola account. Incoming Mail Security should be set to SSL. While this is not required, it is strongly recommended. Select the Incoming Port Number field and enter 995 for a POP email address (110 is SSL was not selected) and 993 for an IMAP email address (143 without SSL) and press OK. Select the Outgoing Mail Server field and enter smtp.freeolamail.net and press OK. Select the Outgoing Port Number field and enter 465 (2025 if SSL was not selected in the previous step) and press OK. Press Save. You may be offered a Terms of Service page, select Accept to continue. Next select Your Email Address, and choose Options, and then Settings. Select Your Email Address, and choose Mailbox Settings. Select the Mailbox Name field, and enter your email address, and then press OK. Select the My Name field, and enter your name, and then press OK. Select Access Point in Use, User Defined and then Internet. Select Security and choose Off. Select User Authentication, and choose Password. Select the Username field and then enter your full e-mail address. Select the Password field and then enter enter your email account password and press OK.
Then return to the start screen. Switch off the Nokia N8 and restart it in order to activate the settings. Your Nokia N8 should now be set-up to send/receive e-mails from your Freeola e-mail address.